As cold weather approaches, the importance of fire safety practices increases dramatically. 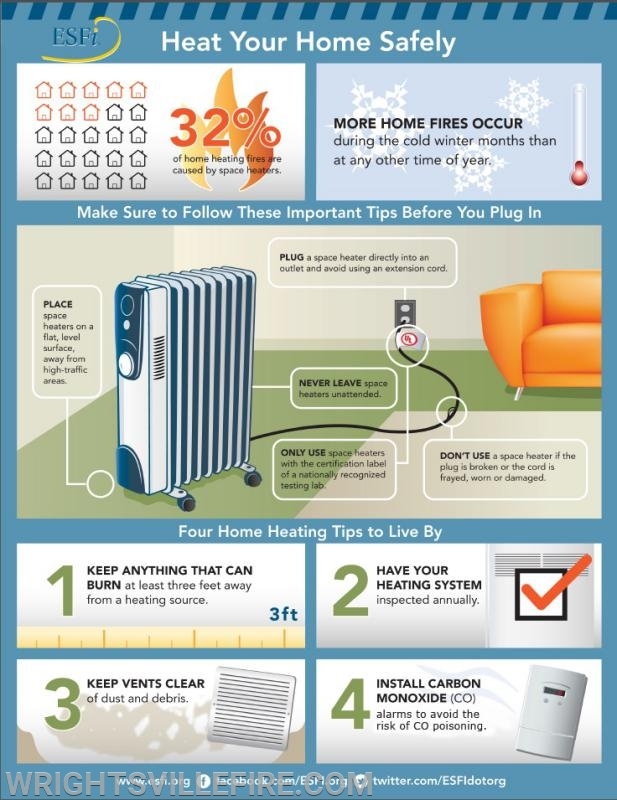 There are many ways that residents heat thier homes, both safely and ways that arent typically recommended. Chimneys are a great addition to the look of a home - but they serve a very important purpose. They are designed to carry dangerous gases from a fireplace or furnace out of the home. Black tar called creosote builds up in the flue and is highly combustible. When the debris that is built up inside a chimney ignites, it burns at extremely high temperatures and breaks down vital componets of the chimney, thus causing extension into the walls of the home and may extend throughout the whole house. Your chimney should be cleaned out regularly before each cold season. There are many chimney sweep kits available to help you do this as well as companies that do this type of thing professionally. Heating systems in homes account for 14% of all house fires in the United States. When using these types of heaters, it is important to keep all flammable items a safe distance away from the heater. i.e.- Drapes, Blankets, Towels, Furniture, etc. The heaters should also have a shutoff feature if the heater would tip over. This automatically shuts down the power to the heater. Kerosene heaters are particularly dangerous because they are typically freestanding units and have no means of ventilation. An improperly operating kerosene heater can release dangerous levels of carbon monoxide and nitrogen dioxide due to incomplete combustion. Kerosene heaters should be operated in a well ventilated or open area. Keeping windows cracked will help if you choose to use these heaters as your source of home heating. Other risks of these types of heating sources include: Hot surfaces, and the risks of explosions. As with any heating source, keep all items away from an operating kerosene heater. Over 1/3 of home fire deaths occur in homes that had non- operating or no smoke detectors at all. Most victims die from the smoke and gasses, not the flames from the fire itself.